With so many changes underway in today’s fast-changing world, the Learning Management System (LMS) has become critical to organizations that are trying to keep employees current on everything from the latest technologies and regulatory requirements, to industry certifications, best practices, including job-specific and leadership skills. The evolution of LMS software is allowing more businesses to invest in and benefit from them. MarketsAndMarkets predicts the LMS market near $8 billion by 2018, with North America leading the marketplace in terms of revenue contribution. The top benefits to maximize ROI from integrating an LMS are highlighted below. An LMS will be truly “mobile” only if all functionality is available to both internal and external learners, instructors, managers, and training administrators. Highlighted below are checks and balances to make you aware of functionality that is not fully extended to mobile users on an LMS. Ideally, a mobile-enabled LMS allows learners to learn anytime, anywhere, on any device. That leaves no room for doubt that an LMS must be fully supported on all mobile devices to reap its total benefits. Appropriately tagging content in the LMS to make it easier to find, helps to dissolve content boundaries within an LMS. Additionally, the benefit of content tagging between LMSs and institutions empowers instructors to more easily share, discover, revise, remix, and reuse course content. Learning today has evolved as an ‘on-demand’ business. Appropriately tagging content so that it is easily found at the time when it is needed, will add value to the learner. Categorization of content with a flexible tagging system goes a long way to organize people, content, and courses. Customization gives you the ability to modify your LMS to perform specific functions and organize your information according to your unique requirements. Some administrative examples include granting or restricting user access, defining user roles and permissions, adding and maintaining custom user fields, designing user registrations tools, organizing users into groups and so on. In short, make use of customization options provided by your LMS to make the tasks which you perform regularly more accessible. Do not worry about “hiding” the more advanced features of your LMS because you probably only access them once a month, and spending an extra 30 seconds on these tasks are insignificant. 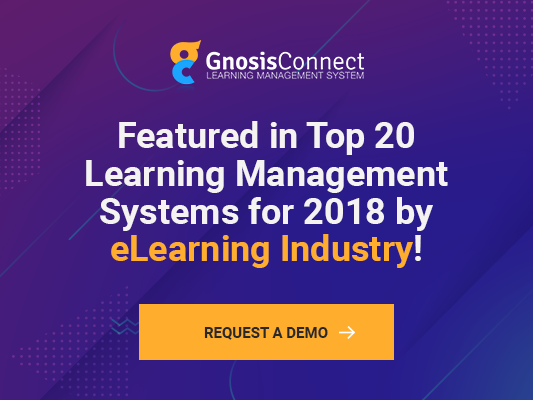 A shameless plug—InfoPro built GnosisConnect LMS for companies which had difficulties finding an off-the-shelf platform and which can be customized enough to match their needs. You can learn more about GnosisConnect and through this blog, be informed that GnosisConnect can be customized 100% to match your unique learning paths. With the advent of big data and the growth in the importance of analytics, organizations are driven to provide in-depth reports. Data in the reports must reference the impact that training has had on their bottom line by compiling and correlating data from across the business to measure the true impact on business. Once the impact on business is proved, Learning and Development and the LMS will become a key resource for many in the business, significantly increasing the demands for training. Tapping the right reporting capabilities an LMS offers will provide the necessary data and analytics a company needs to prove the impact that the LMS has on the business—much more than just who has completed what training. Summarized thoughts: There are many more benefits. To put together a plan of action, consider the top benefits listed here and move on with your next steps to help you squeeze the revenue out of your existing LMS investment—a sure shot way to fire up your organization’s economic engine. Samantha Ferns is an independent Instructional Designer currently working with InfoPro Learning. She loves working on creative projects where she can use her imagination and storytelling skills. Samantha has seven years of experience in Instructional Design and about three years in classroom training and training management. She enjoys travelling, learning new languages, and working for animal welfare.